Hello all and Happy Thursday! 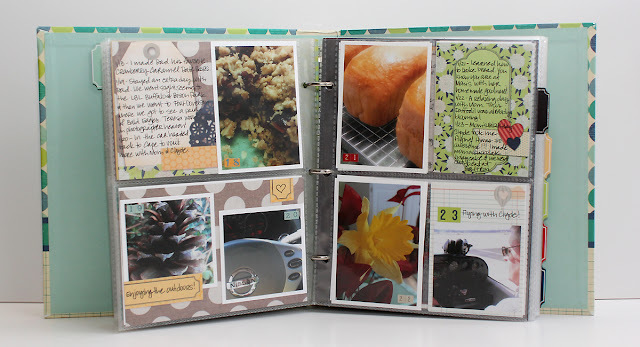 Today, I am sharing with you my first attempt at a Project Life type album using the new Bo Bunny Misc Me collection. On January 1, 2013 I started Project 365 and began taking a photo a day. So far, I have been able to stick with my goal. Some days, my life feels rather boring and uneventful, but I make sure to take a photo of something I did or saw each day even if it is boring! I choose to use the Misc. Me Family Is.../Graphic Album to help me document these photos. 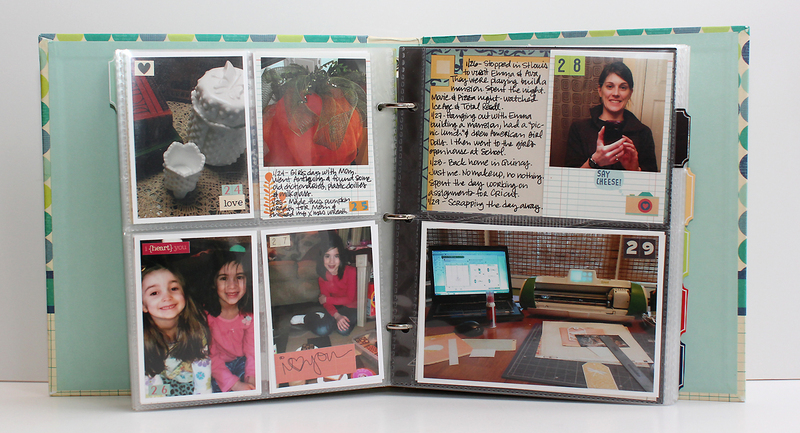 I knew from the beginning that I wanted to keep this project simple and to keep the focus on my photos and journaling. These are not scrapbook pages and I don't want it to replace that creative outlet for me. I am doing this to document my life in a new way and to maybe learn a little something about myself along the way. When I first decided to begin my Project 365 I decide that I would take all of my photos using my camera phone because it is handy and always with me. I also decided that I didn't care about the quality of the photos and that I would not allow myself to do anything buy crop the images to the size I needed for the album. I choose to have my photos printed using Walmart's one hour photo processing because they use matte paper and I prefer to work with matte photos because you avoid finger prints! I am using ShutterCal to help me organize my photos and I even write a little blurb there to help jog my memory about the events of the day. 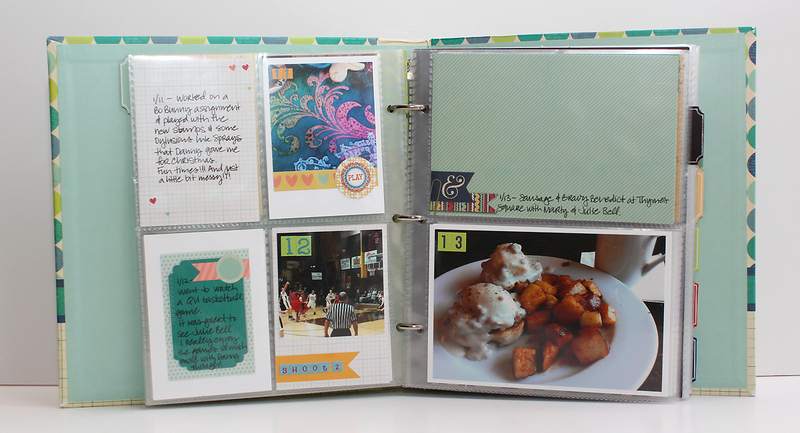 I did this month all at once and printed all of the photos at the end of the month. I think it worked out OK, but I may switch this up as things progress through year. Right now I am a month behind because I haven't started on February yet! But I will be sharing that with you as well. 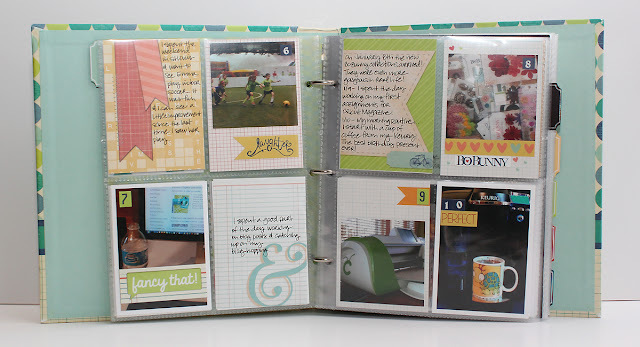 On the Bo Bunny blog we are planning to share projects using the Misc Me collection on the last day of the month every month for the remainder of 2013. I can't wait to see all the inspiration from the other gals as I know some of them will really step outside the box with this collection!!! I matted most of my photos on white cardstock, however some of them are matted directly onto the Graphic Note Paper pieces. 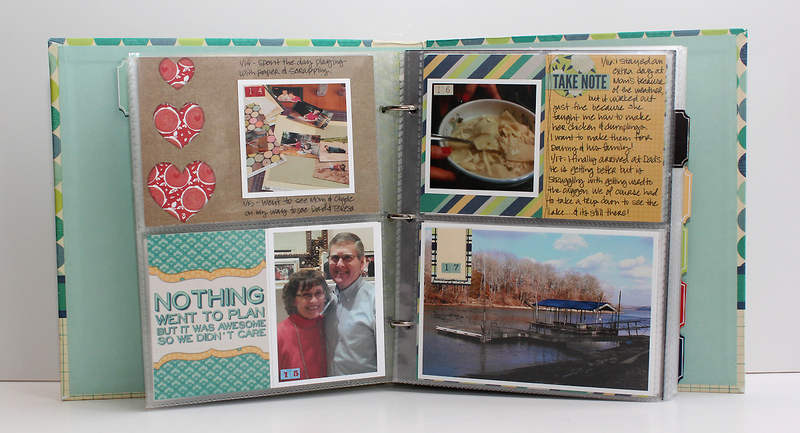 A little trick I used on the left hand side of this page was to cut one of the 6x8 pages from the Family Is Contents in half. I then trimmed it to size and put one part in the top sleeve and the other half in the bottom sleeve. I repeated that same process on the left hand page. I have to admit, this has been quite a learning experience for me as I have never created a project life type album. I actually struggled a little bit trying to figure out how to make it work. During the coming months, I really expect to see my album grow and change and I am looking forward to the journey! If you are doing something similar to this or are using the Misc Me collection, please share a link! I would love to check it out and leave you some love as well!!! Maybe it is wishful thinking, but I feel like Spring is in the air! Something about having more daylight hours does that to me. Now if the temperature outside would just cooperate, we could get there a little sooner!!! 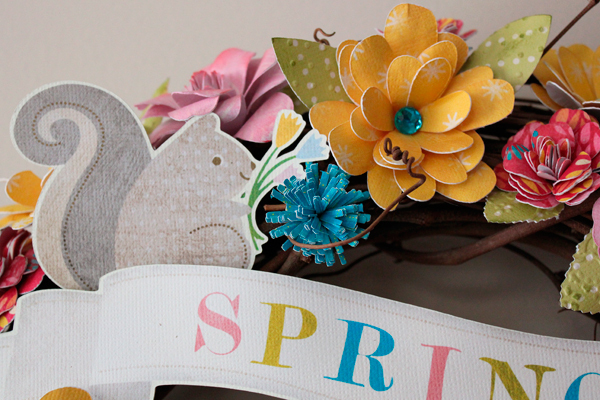 Until then however, I thought this project would help us all get in the mood for Spring. 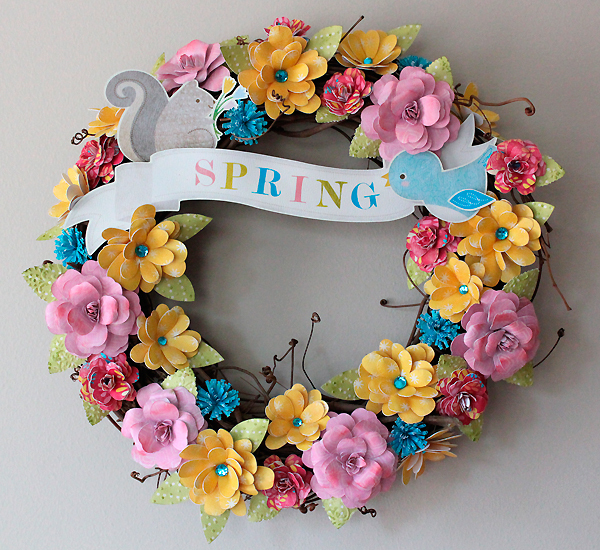 This is another project that I created when I was part of the Cricut Circle and today I am going to share with you how to make your own Spring wreath. 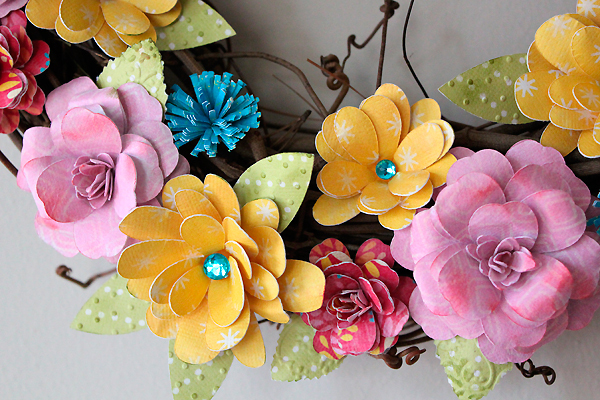 I even have a video on how I created the flowers! 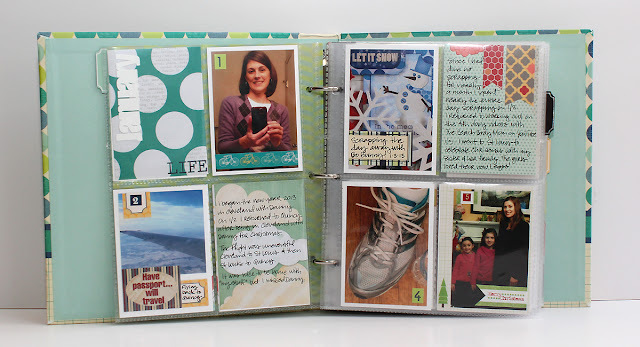 All of the papers I used were printed on the Imagine using the Enjoy the Seasons Art Cartridge with the exception of the leaves which were printed using the Elise Colors and Patterns Cartridge. 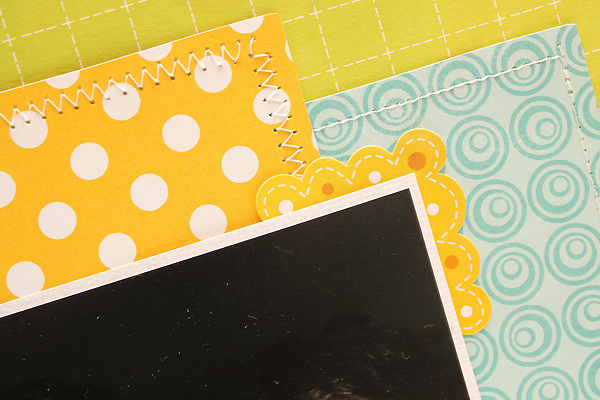 I printed the patterns onto white American Crafts cardstock. The base of the wreath is simple grape vine wreath from a local craft store. 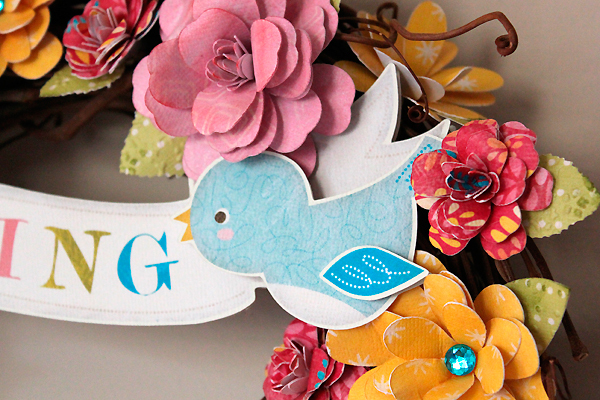 The blue flowers were created using the larger Cuttlebug Chrysanthemum Quilling die. All of the other flowers were created using a combination of flowers as noted in the instructions below. 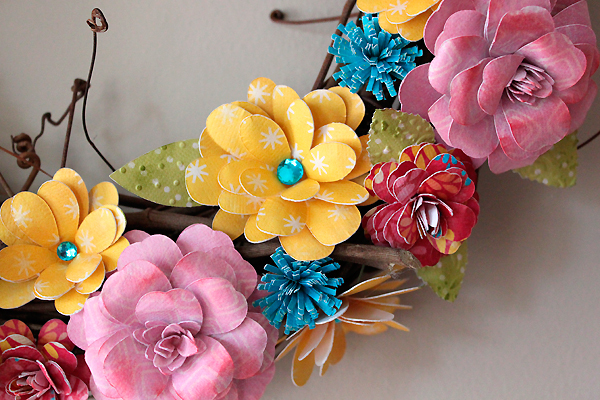 Once I had cut and put all of the flowers together I hot glued them to the grapevine wreath. The pink roses were given a light misting of Pink Bubblegum Glimmer Mist and then lightly inked with Worn Lipstick Distress Ink to give them a darker pink color. I embossed the leaves using the Cuttlebug after I had cut them out and then lightly inked them with Peeled Paint Distress Ink. Good Monday morning all! 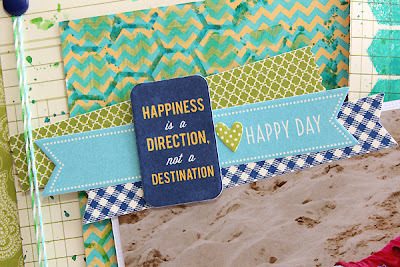 I have a couple Bella Blvd layouts to share with you today and to direct you over to the Bella Blvd blog to check out more details and other projects being shared there. Both of my layouts feature the Birthday Boy collection with a twist! I used them for layouts about MY birthday and I am most certainly not a boy! LOL!!! I just loved the orange, green and blue in this collection and they went perfectly with the colors in my photos. 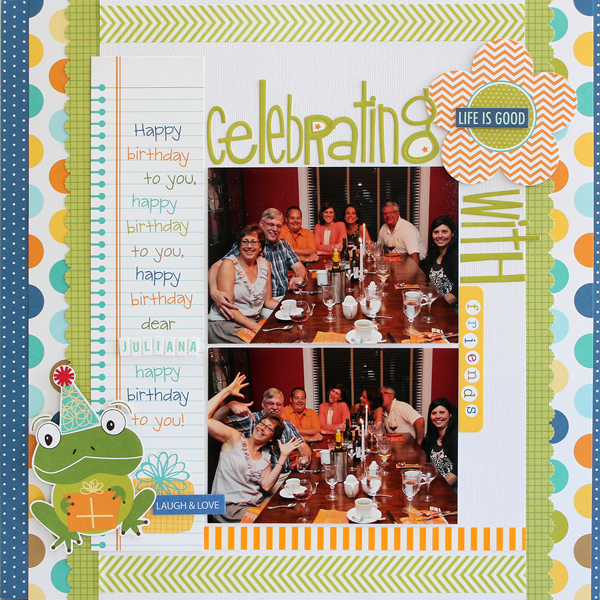 I did very little embellishing on this layout, but I knew one thing I HAD to add to this layout. 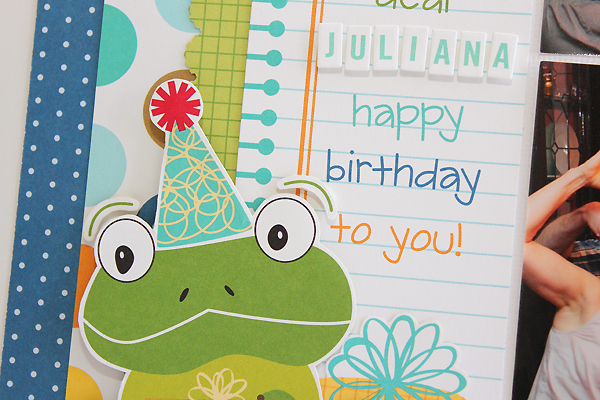 This adorable frog from the Cute Cuts paper!!! I fussy cut him, mounted him on scrap chipboard for more stability and then adhered him with double sided foam tape. 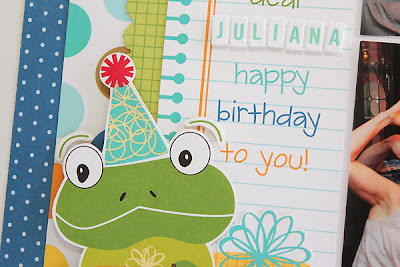 I wanted him to "hop" off the page at you!!! 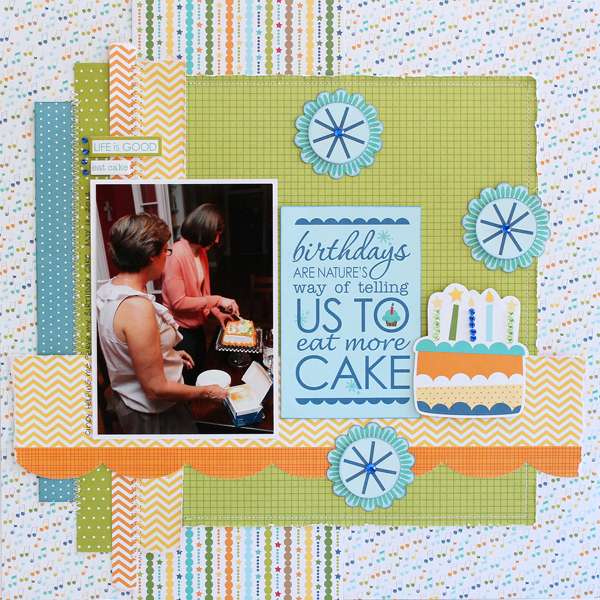 For my second layout I again did very little embellishing to help keep the focus on the photo. 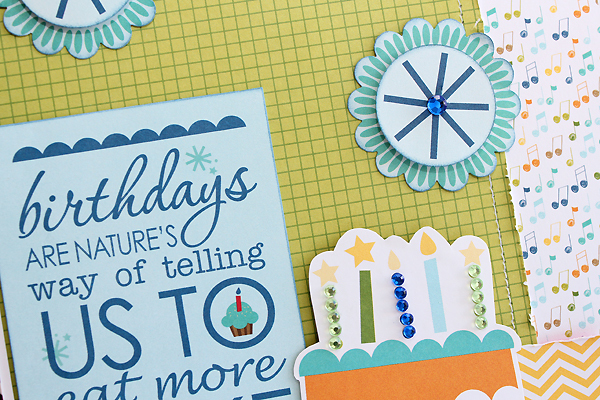 I fussy cut the cake from the Cute Cuts paper and dressed it up with some bling. 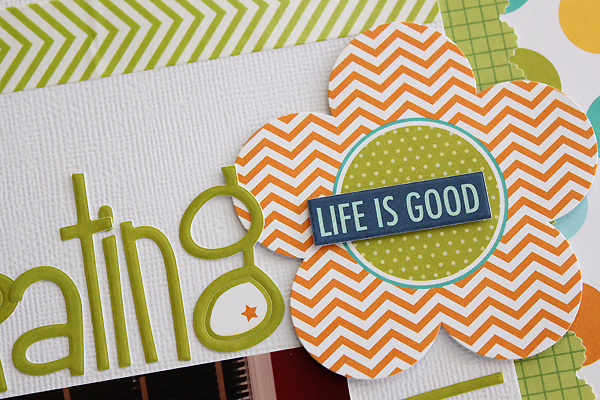 I created the flower shapes by punching the images from the patterned paper using a scallop circle and circle punch. 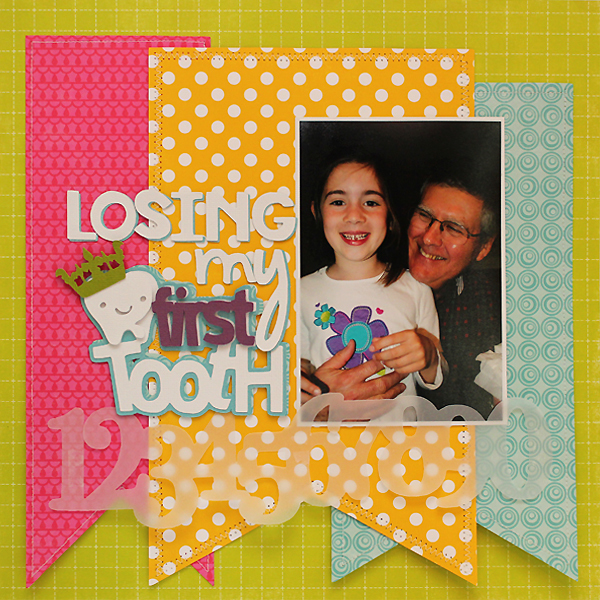 I then layered them with double sided foam tape and added a jewel to the center of each one. 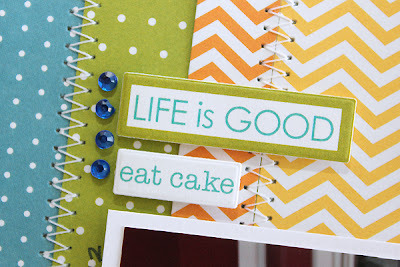 Thanks for stopping by and make sure you check out the Bella Blvd blog for more inspiring Bella ideas!!! Hello & Happy Friday! 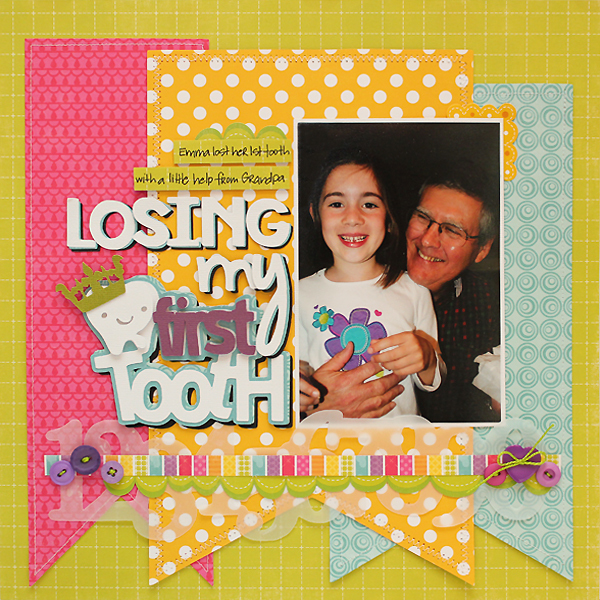 Today I have a recent layout I created while playing with some Jillibean Soup Hexie Stickers and my Crafter's Workshop stencils. 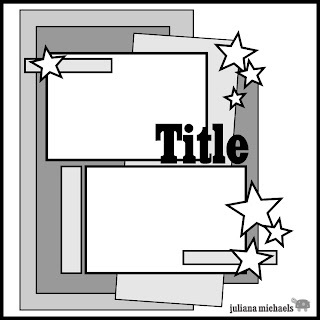 When I was playing with the template I used a fun technique that I saw on either Ronda Palazzari's or Julie Fei-Fan Balzer's blog. I'm not sure which, maybe it was both! Anyway, I first placed the template on the cream lined paper and misted it with some Dylusion's Ink. Then I took the stencil and laid it onto the yellow and blue chevron paper and rubbed what ink was left on it. I love the way it turned out and how it dramatically changed the look of the original paper. You can see a bit more what I mean on this close up photo. Now, as I mentioned in the title of today's post, here is a sketch for you to use based on my layout above. You are more than welcome to use it to create your own layout. 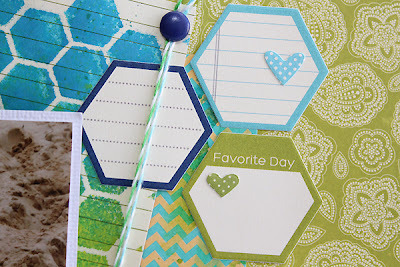 If you do use it, I would really love it if you would share it with me either here on my blog or on my Facebook page! I hope you enjoy the sketch!!! Happy Monday all! Today I am sharing a layout I created for the Circut Circle and as I was going through my files I realized I had never shared it here. 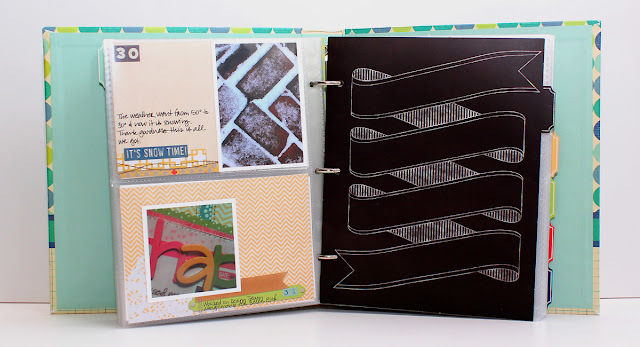 I thought it might be a good one to share because of how I discuss the way I use the Criuct Craft Room to create layouts. I hope you enjoy the tutorial! About a year ago, my niece lost her first tooth. My sister was sweet enough to send me the photos. She was so excited and it was spurred on by the fact that Grandpa was there to help! It had been hanging on by a “thread” all day and he helped her wiggle it loose so that the tooth fairy could come! She was all smiles and so was he…so proud of their accomplishment together!!! This is not the final design that I used on my layout, but you get the idea. 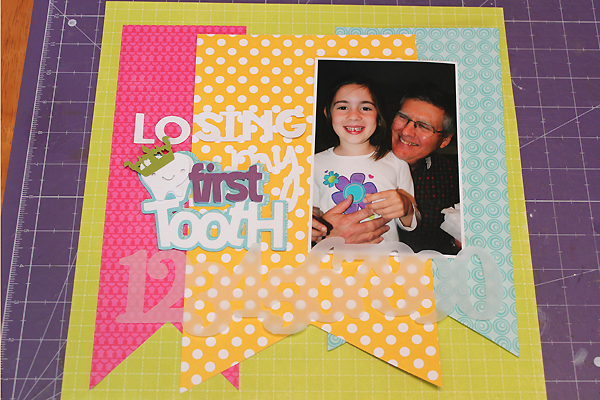 I use the fill mode to add the various colors that I want to use based on the papers that I want to use. This works really well with papers that are mostly one color. It helps give me any idea of how things will look before I cut them out and this process keeps me from wasting paper. I am a very visual person and I usually need to see how it is going to look before I can decide if I am going to like it. I don’t do well trying to imagine how it will look. So that is why adding the colors to the different images helps me out. I ended up switching the design from the screen shot to what you see below after I had cut everything out and was placing it together. I realized that the blue banner and the blue behind the title were not going to work. You couldn’t see the phrase, so I switched things around a bit and it worked just fine. I also liked the photo better on the right hand side of the layout because it brought my niece toward the center and put more focus on her. 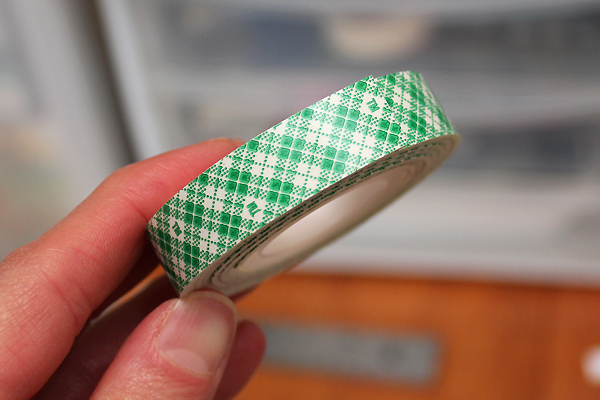 The next thing I have to share is one thing that I CAN NOT scrap without it…3M Double Sided Mounting Tape. I really wish it came in larger rolls!!! Why do I love it? Most other foam tape options are too thick for my taste and I love that I can cut this to any size I want. 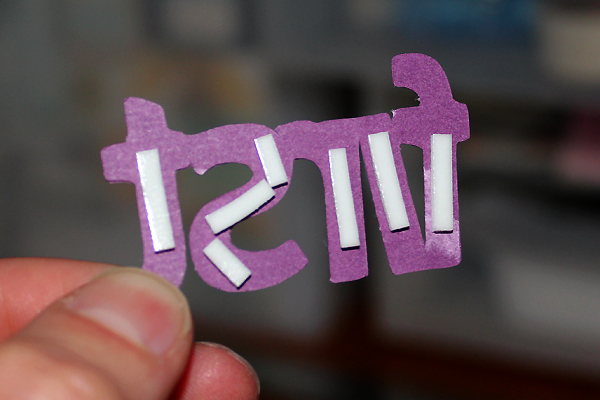 I cut thin strips of the tape to attach this cut to the phrase piece for added dimension. Here is the completed layout. Well almost! You could certainly call it finished with the addition of a little journaling. I however, felt like it needed a bit more to “dress it up”. I decided to back the title letters with black letters. 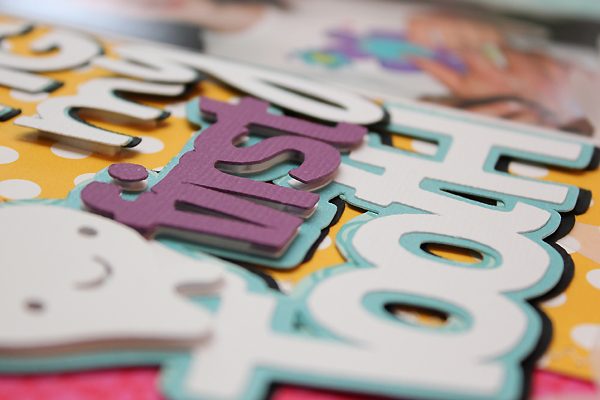 All of the letters are cut the same size, I just offset them so that you could see the color. 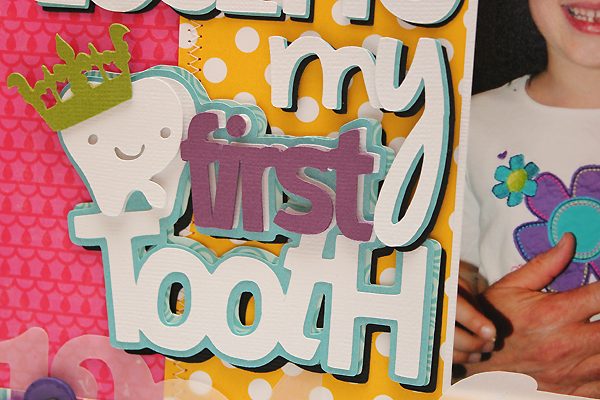 I also did the same thing with the “first tooth” phrase piece. I think it helps the title stand out a bit more! The stitching on the banners was there in the first layout, but here you can see a close up. This is something that can add a nice finishing touch or just that little extra something to make your layout shine. And it certainly doesn’t have to be done with a real sewing machine. I have seen plenty of faux stitching that gives me a double take and it is a lot faster than pulling out the sewing machine. I recommend a white gel pen or white out pen. Another bit I did to dress this up was to add a strip of patterned paper (a ‘B side” scrap from one of my banner cuts) and a border sticker on top of the vellum border. I then finished it off by adding some buttons to each end. The placement of the purple buttons creates a visual triangle with the purple letters in the title. 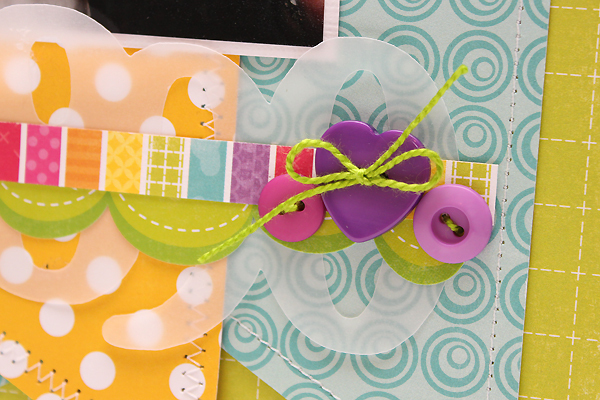 The green thread adds a nice contrast to the buttons but also creates a nice visual triangle with the green border sticker, crown and journaling strips.This is just a close up of the dimension provided by the use of the foam tape and multiple cut layers. 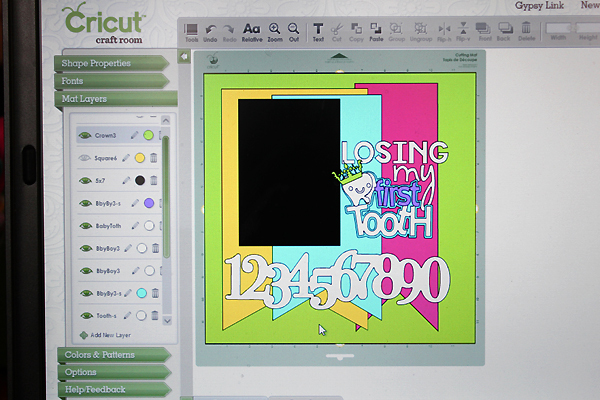 I hope enjoyed a peek into how I use the Cricut Craft Room! Happy Cricuting!! !